In 1788-89, King George III suffered his first episode of serious ill health. By March 1789, he was in remission, and for 12 years reigned as a popular monarch and a symbol of security in the era of France’s revolutionary chaos. 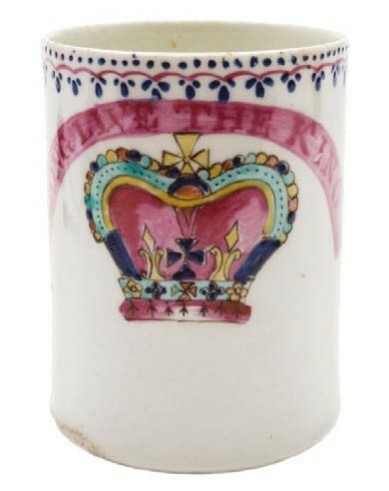 This Lowestoft ‘Royal Commemorative’ mug above is thought to celebrate the return to health of the king in the 1790s, and appears to be an unrecorded version. It bears a paper label inscribed Levine – a reference perhaps to the Ruben Levine collection, which was sold at Sotheby’s in 1925. It is estimated at £3000-5000 in Bearnes Hampton & Littlewood’s sale in Exeter on January 22-24. George Kidner’s sale on January 11 in Lymington, Hampshire, will feature a Dutch silver perpetual calendar. 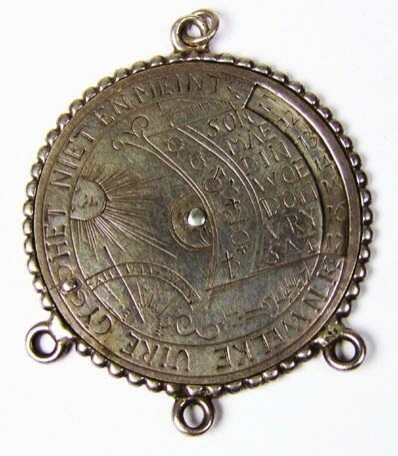 Dating from c.1700, the 1¾in (4.5cm) wide instrument is inscribed on one side with Euwigdurende Almanack and the days of the week on the other.